Happy Saturday! Hope your weekend is full of sunshine wherever you are. I have a few projects made for RRR. Goodies made with your favorite gal pal's birthday in mind! Pretty in pink and oh so feminine. Some fun cards and a sweet pillow box to fill with candies or keepsake/gifts. I used a combination of paper scraps, stickers, chipboard pieces, and more to create these sweeties. Along with Bay Leaf and Rose Petal seam bindings I also used cotton candy bakers twine. These sweeties are all available in my Cherry's Jubilee etsy store! IT is a late, late, late Summer night....and I am the only one up! Perfect time for me to catch up on so many things that need checking off my list! I have been excited for awhile now to share one of my new kits I created for Photographs and Memories. Perfectly named "For all the girls"
Think back to your school days....simpler times....times spent frolicking with your gal pals. I remember leaving in the morning and not coming back till dark. We lived out in the country and we had such adventures. Memories I would not trade for anything! These are girls and ladies that harken back generations. Some of the sweetest images are included in this kit. I was so keen on getting the right color combinations that would truly compliment the images. They just make me smile! I think they will make you smile too......you can buy one for yourself here For all the Girls card kit. Hi guys...happy weekend! We have a wonderful new challenge at RRR. It is a sizzlin with summer colors challenge with ribbon. Now I can' think of anything more Summer to me than the ole 4th of July. I love to decorate during the Summer with red, white, and blue. I used paper scraps, a vintage mage, lots of layered stars. I also took a felt star and wrapped cherry twine with it and added a little vintage pin. I also added blue jay and lipstick red seam binding for my bows. Hey Petaloo peeps, Cherry here again to share a card with an inspirational quote perfect for the grad in your life! Using the Henry David Thoreau quote as my jumping off point for color and inspiration. I used glimmer spray in Mallard to add color to my ribbons, burlap butterfly, and one of my textured layered blooms. I wanted some contrast with my color so I added two burlap blossoms. Other than that I used some metal scrolls and was done. Simple and elegant! Howdy, hi, salutations....covering all my bases today! My day at the RRR blog. So trying to get back to some kind of normal....and failing miserably. One of my favorite type of images are any with cats...dogs....maybe because our animals are such a part of our family. My cats and dog truly keep me sane. I fell in love with this endearing image. The little girl and cat are so sweet. Since it is a black cat, I thought the lucky bingo card was perfect...and than my sentiment was born! red, black, white....polka dots...yes please!!! I used lipstick red seam binding and made a BIG poofy bow. I added some vintage red buttons....which I often times hate to part with because they are sooooo hard to find!!! My papers are all Graphic 45. Hello Petaloo Peeps! Cherry here with my first ever design team post. It is all about the "Grads" this time of year. Our family is no exception. My son just graduated as valedictorian of his class this past weekend. A wonderful but bittersweet milestone. With his graduation party we kept with a classic black/white theme. I just love this color combo and think it is perfect for graduation projects. I decided to make a card using this simple but effective combination. I used Papers from Canvas Corps. They complimented the burlap daisies perfectly. I love playing with all the layers you can create with these blooms. Instead of putting a stamen or button in the middle I decided to use one of the burlap picks. I love all the dimension it added. The picks added such a classic touch to this card! From here I added a hand stamped sentiment and some black scrunched seam binding. Other than that, a key was tucked into the bloom as a symbolic touch. "the key to your future". Really Reasonable Ribbon blog hop time!!!!!!!!!! Helllllllllllllo folks! Long time no chat! My son graduated high school June 4th and things have been busy and ever so emotional. He graduated valedictorian of his class and I am so proud of him. I just had to share...and brag a little! Hey I get to do that...he is my one and only. 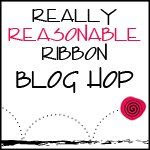 Life is getting back to normal though and today is the day for RRR blog hop! You should have found your way here from Deborah's blog. If you find yourself lost at any time just start back at the RRR blog. This month's ribbons are full of happy delightful colors. They remind me of citrus fruit and the warm Summer sun. With the emotions going on in my heart it felt so good to create again and make a fun cheerful card. I hand stamped a sweet primitive style sun and fussy cut it out. I created "my scene" using the sun and cute cloud....and used bright colors to make the citrus yellows pop. I wanted to use a pop of red as well, so I added a cute rosette. I kept my sentiment simple so this card could be used for different occasions. The buttons also use a bit of baker's twine in lemon. I love, love, love the honeycomb printed ribbon.